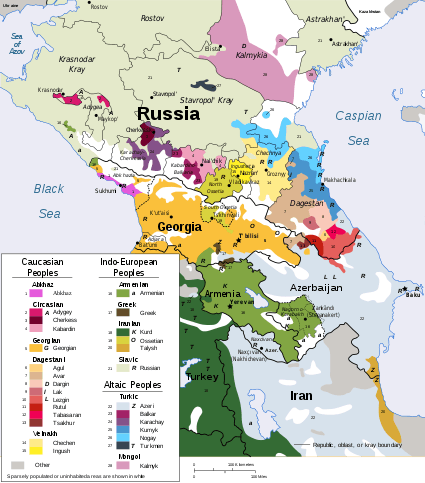 Ingush (/ˈɪnɡʊʃ/, ГӀалгӀай, Ğalğay, pronounced [ʁəlʁɑj]) is a Northeast Caucasian language spoken by about 300,000 people, known as the Ingush, across a region covering the Russian republics of Ingushetia and Chechnya. Ingush and Chechen, together with Bats, constitute the Nakh branch of the Northeast Caucasian language family. They are not mutually intelligible, though there is pervasive passive bilingualism between Ingush and Chechen. Ingush is spoken by about 413,000 people (2002), primarily across a region in the Caucasus covering parts of Russia, primarily Ingushetia and Chechnya. Speakers can also be found in Kazakhstan, Uzbekistan, Turkmenistan, Belgium, Norway, Turkey and Jordan. Ingush is, alongside Russian, an official language of Ingushetia, a federal subject of Russia. Ingush became a written language with an Arabic-based writing system at the beginning of the 20th century. After the October Revolution it first used a Latin alphabet, which was later replaced by Cyrillic. The diphthongs are иэ /ie/, уо /uo/, оа /oɑ/, ий /ij/, эи /ei/, ои /oi/, уи /ui/, ов /ow/, ув /uw/. Ingush is not divided into dialects with the exception of Galain-Chazh (native name: Галайн-ЧӀаж), which is considered to be transitional between Chechen and Ingush. Ingush is a nominative–accusative language in its syntax, though it has ergative morphology. The most recent and in-depth analysis of the language shows eight cases: nominative, ergative, genitive, dative, allative, instrumental, lative, and comparative. -uo is the only productive form. -z appears with personal names, kin terms, and other nouns referring to humans. -aa occurs with some declensions and is increasingly productive in colloquial use. The choice of -azh vs. -ii is lexically determined for the nominative, but other cases are predictable. Like many Northeast Caucasian languages, Ingush uses a vigesimal system, where numbers lower than twenty are counted as in a base-ten system, but higher decads are base-twenty. Note that "four" and its derivatives actually begin with noun-class marker. d- is merely the default value. In Ingush, "for main clauses, other than episode-initial and other all-new ones, verb-second order is most common. The verb, or the finite part of a compound verb or analytic tense form (i.e. the light verb or the auxiliary), follows the first word or phrase in the clause". ↑ Hammarström, Harald; Forkel, Robert; Haspelmath, Martin; Bank, Sebastian, eds. (2016). "Ingush". Glottolog 2.7. Jena: Max Planck Institute for the Science of Human History. ↑ Johanna Nichols, Ingush Grammar (Berkeley: University of California Press, 2011) ISBN 978-0-520-09877-0. ↑ Johanna Nichols, Case in Ingush Syntax, and Johanna Nichols,Ingush Grammar (Berkeley: University of California Press, 2010). ISBN 0-520-09877-3. ↑ Johanna Nichols, Ingush Grammar. ↑ Zev Handel, Ingush inflectional verb morphology: a synchronic classification and historical analysis with comparison to Chechen http://faculty.washington.edu/zhandel/Handel_Ingush.pdf. ↑ Nichols, Johanna. (2011). Ingush Grammar. Berkeley: The University of California Press. Pp. 678ff.